In this busy and connected world, full of life’s responsibilities, stress can get to the best of us. Anxiety, worry and fear which crop up from time to time are normal responses to situations that mostly involve work, money, school, relationships or an uncertain future. Stress affects everyone regardless of age, ethnicity, marital status, level of income or education. But how does stress affect our bodies and what is the best way to deal with it? Moderate levels of stress make us alert by heightening our senses. This helps us perform better in certain circumstances such as public speaking or working to a tight deadline. Athletes use stress to run faster, jump higher and respond quicker. In the workplace, stress motivates productivity and the pressures we put on ourselves inspires progress and innovation to making things better and move things forward. So stress can be very useful and healthy. However, stress can only be good if it doesn’t last long. Chronic stress can lead to headaches, insomnia, high blood pressure, anxiety, depression, digestive problems, chronic low back pain, weight gain and a weakened immune system, which then opens the body up to many other illnesses and diseases. According to the American Institute of Stress, it’s the basic cause of 60% of all human illnesses and diseases which includes cancer and heart disease. This is a human performance curve. 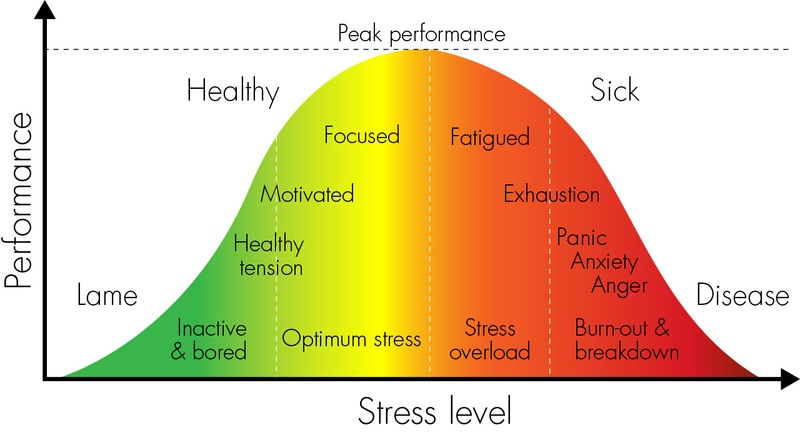 The Yerkes–Dodson law dictates that performance increases with physiological or mental arousal (tension or stress), but only up to a point. When levels of stress become too high, performance drops and sickness follows. BUT HOW CAN STRESS PHYSICALLY HARM THE BODY – ISN’T IT ALL IN THE MIND? Harvard professor, Dr Walter Cannon, first suggested the flight or fight theory which is that, in times of perceived danger, the brain releases a cocktail of hormones into the bloodstream. This surge of hormones includes adrenaline and cortisol which help the body deal with the immediate perceived danger. Adrenaline raises the heart rate and increases blood pressure which helps with reaction time. Cortisol, a steroid hormone, releases glucose into the bloodstream which increases the amount of energy available to the muscles. All so you can either fight for your life or run for your life. These stress hormones also shut down metabolic processes such as digestion, reproduction, growth and immunity. A good trade off, as your body’s attention is better served trying not be to killed than growing, digesting or ovulating. Think about this, if a hunter shoots a deer and doesn’t kill it outright, the animal panics and tries to escape. If the hunter does eventually kill the deer, the stress hormones released into the animal’s body ruins the meat. Those are some powerful chemicals. But, in today’s modern lifestyle, our stresses are a far cry from those of our ancestors. We are not dealing with attacks from savage warriors or having to run away from saber-toothed tigers. We have everyday stresses like getting stuck in traffic, dealing with a nasty co-worker, worrying about an upcoming exam, not being able to pay a bill on time, or just being concerned about what other people are thinking of you. These situations trigger a negative emotion which our brains perceive as a threat and, unfortunately, we still react in the same way by secreting stress hormones into the body. On top of that, we don’t use up these hormones fighting or flighting, instead we are stuck in our cars in a traffic jam or trying to be as professional as possible at work, or we are clinging onto our grudges or grievances. Over time these hormones build up and change the body’s biochemistry, interfering with sleep patterns, digestion, reproduction and, most importantly, disrupting the immune system, leaving the body unable to heal or defend itself. We feel that one of the causes of Jon’s stomach cancer was the result of the stress he put himself under. Running his own law firm and keeping his finances in order. Making sure his staff were happy and they received their pay checks at the end of each month. Dealing with clients and their emotions that were projected onto him. All these things can trigger the stress response which then in turn leads to physical stress on the body. However, on the flip side to the ‘fight or flight’ stress response, is the relaxation response. When our beliefs are hopeful and optimistic, the brain releases health-inducing chemicals called endorphins which counter stress hormones. Endorphins interact with receptors in the brain reducing our perception of pain which is similar to the way in which morphine and codeine work. As well as being natural painkillers, they help with appetite, digestion, sleep and they boost the immune system. It is only in this rested, relaxed state that the body repairs itself, digests, reproduces and also grows. So changing your thoughts also changes the way your brain communicates with the rest of your body, altering the body’s biochemistry. Tricking the mind into thinking the body is healing itself which leads to the body physically healing itself, is called the placebo effect. It is the belief you are getting the right treatment, and then expecting to get well from it. Placebos have been known to decrease blood pressure, heal ulcers, reduce inflammation, drop cholesterol levels, shrink tumours and even hair has been known to grow on a bald man’s head. Sugar pills, saline injections and fake surgery used in clinical trials have all demonstrated that the mind has the power to heal, if it’s given the right intention or belief. Around 40% of people with an headache will find relief with a placebo sugar pill. Believing you feel differently can make you feel different. Our bodies are self healing mechanisms. When we cut ourselves, our body will stop the bleeding, fight the infection and our skin will eventually repair itself. This works inside the body too. We are naturally wired to heal ourselves, we just need the right tools to keep everything under control… and by tools we mean ingesting essential nutrients from a healthy diet, regular exercise, maintaining a good body weight, getting enough sleep and having healthy, positive thoughts. Our minds can make us sick, as well as heal us. Our feelings and beliefs affect every cell. We have the power to heal our body just by changing the way our mind thinks and ultimately feels – that’s such an empowering idea. Change your thoughts, change your biochemistry, change your health. SO HOW DO WE CHANGE THE WAY WE THINK? Well, this is the tricky bit. A lot of negative beliefs stem from childhood like being told you’re not good enough, that you’re weak or that you need to be successful before you can be happy. Your subconscious mind gets filled with false beliefs and, even by the age of 6, it’s hard to rewrite beliefs which have already been reinforced. Stressful situations will always be there and we can’t change that. What we can change is how our brains perceive those situations and therefore, how we react to them. Recognising and understanding situations that trigger the stress response help how we consciously react to them and, eventually, rewire the brain to change how we feel about them. The operative word here is feel. The stress response will always trigger a feeling or emotion and that feeling or emotion will usually be based on fear. Our stress triggers fall into 4 broad categories: novelty, unpredictability, loss of control and threats to the ego. In other words: something new that you haven’t experienced before, something unexpected which you had no way of knowing would happen, having no control over a situation and when your competence as a person comes into question. If the stress response triggers, it is usually from one or more of these situations. So, the trick is to change the way our brain perceives these situations. If we can see stress in a positive light then it will become a challenge, instead of a threat. All emotions stem from either love or fear. Love centres around oneness with the universe and the understanding that everything is connected. Love is all encompassing and has no possession. Gratitude, empathy, happiness, compassion, fulfilment are all based on the emotion of love. Fear centres around the self and the self’s own universe. Fear is based in the ego. Anger, resentment, greed, guilt and shame all come from the ego. Comparing oneself to others, feeling inadequate or hard done by, holding grudges and harbouring grievances, resenting other people’s successes, not saying no, being embarrassed about what car you drive or feeling guilty because you let someone down – all these feelings and situations centre around the self and the ego and they bring a whole lot of emotional stress along with them too. There is a false belief that our external world can predict our happiness levels. The truth is that our main source of happiness is how the brain processes the world. We can remove a lot of these fears by reframing how we see situations and by not letting the ego take control. Comparing yourself to others, worrying about what other people think or what that horrible stranger said you on the train – that’s your ego talking. You’ll find the lives of the people you compare yourself to aren’t the box of fluffy ducks which you see on Facebook. The person you worried about because you thought they may have a bad opinion of you, was actually not thinking about you at all. They were thinking of themselves and how they appeared to you! And that guy on the train had just had a fight with his wife and would have said what he said to anyone, you just happened to be there. Taking things to heart will literally take them to your heart. So make sure what you are taking to your heart is worthwhile and true. The time you take to worry about threats to your ego is wasted and can be harmful to your body. The stress caused by trying to succeed can be a killer. The idea that you need to be successful to be happy. In other words, the harder you work the more successful you’ll be and the more successful you are, the happier you’ll be. You can easily become a slave to this mantra because success is always over the horizon (along with happiness). When you achieve success, your brain just changes the goal posts as to what success looks like. You get the job you always wanted then you want a better job. Once you finally earn that salary, you’ll just want more. You’ll never be completely satisfied because the goal posts keep changing. You’re always waiting for something better to happen. 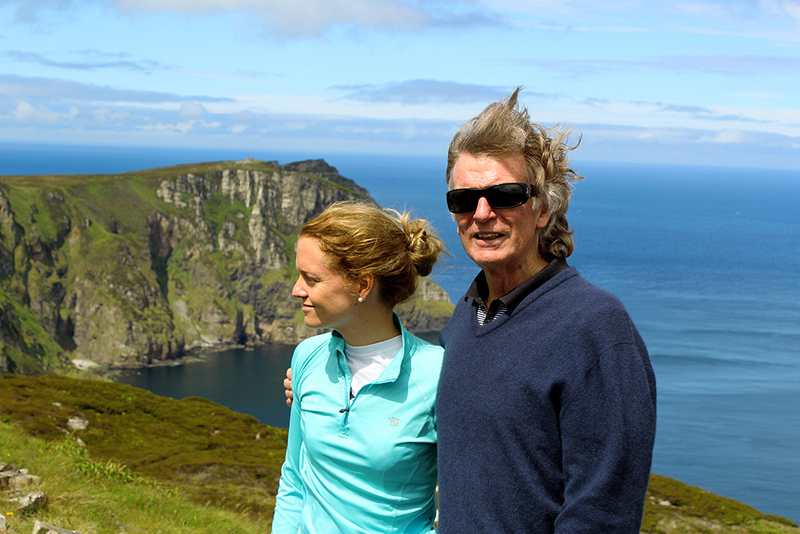 Jane and her Dad in Donegal, Ireland, circa July 2015. Visiting his great great grandfather’s family land and meeting up with old friends. Dad was so grateful he was able to come back. The real joy in life is appreciating what you have. Beautiful relationships with family and friends, walks in nature, riding your bike down a hill with the wind blowing through your hair, having clean running water. There is a saying that goes, “comparison is the thief of all joy”. There will always be a Joe Soap next door who has more than you, but if you really want to compare your life then compare it to a family in Nepal who have lost family, friends and all their possessions to an earthquake, or Syrian refugees on Crete who have lost their country. Those are real stresses. We are spiritual beings. Emotions are filters through which we see the world, they are not us nor a part of us. When you feel an emotion you don’t like, take a deep breath and ask yourself, “is this me or is this my ego talking again?”. If it’s your ego, then acknowledge the situation for what it is (it has nothing do with you, you’re just allowing yourself to take it personally), take that emotion by the scruff of it’s neck and then, as Elsa says, “let it go, let it go, don’t let your ego hold you back anymore” (or something like that). Not being a slave to your ego is the most liberating feeling in the world. Once you lose your ego, you lose fear and then nothing can touch you. We need to get over ourselves, stop worrying about our bruised egos and stop taking everything so personally. We need to be grateful for how lucky we really are. The fact that we get to live on this earth is a privilege, a joy and everyday is a miracle to be be cherished and appreciated much more than it is. We must become positive and live in the present. There are things we can do everyday to train our brains to become more positive. These simple things have been proven to help change the way our brains view the world. Keep a gratitude journal and every morning write down 5 new things that you are grateful for. Do this everyday for 21 days in a row and by the end, your brain retains a pattern scanning the world for the positive rather than the negative. Writing a down a positive memory from the day before makes your brain relive that experience. This 2 minute exercise done everyday for 3 weeks can rewire your brain, allowing your brain to work more optimistically. Practising mediation keeps the mind focused on the present. This quietens down the brain and gives it a break from our culture of multitasking. This brings the brain’s attention to the moment and what you are doing then and there. Have you ever noticed in times of stress how a run or trip to the gym calms you down and helps you feel more relaxed? Well, exercise is really helpful in reducing stress in the body. Firstly it releases mood-improving endorphins into the brain which boosts the immune system, but maybe more importantly, exercise burns off the excess stress hormones in the body. This could be as easy as sending an email thanking or praising someone. Maybe it’s a positive comment on what a work colleague is wearing, or a small thoughtful gift. Performing random acts of kindness trains the brain to consciously think of others instead of yourself. By doing these activities you can train your brain (just like you train your body) to think in a positive and healthier way. You can make yourself sick when the mind thinks unhealthy thoughts, but you can also repair your body with healthy thoughts. With this knowledge you can choose health. Choose to have positive thoughts, loaded with good intention, then focus those thoughts on your goals and dreams and who knows? The mind is a powerful tool that we CAN take control of. The filters through which your brain views the world shapes your reality. If you change the filter, you can change your happiness, and your reality. If we try live our lives through filters of love and all the great emotions that come with it, our brains will release the good stuff responsible for digesting, growing, sleeping, learning, and improving your mood, and we will live much happier, and healthier lives. 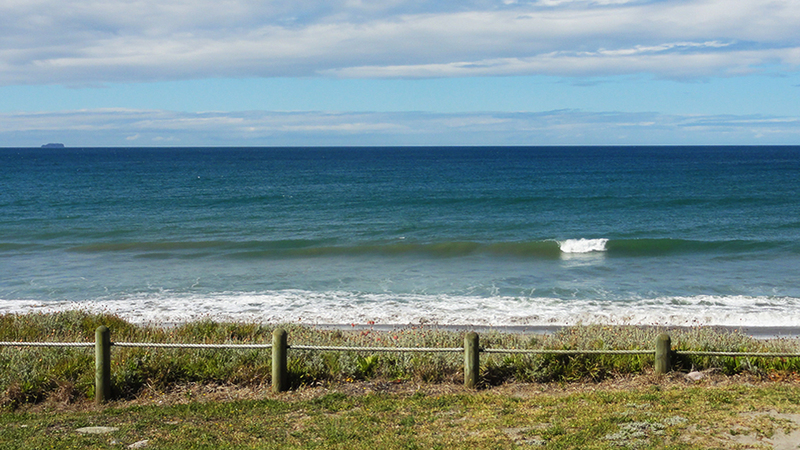 Pukehina, Bay of Plenty, New Zealand. This is where dad triggers his relaxation response. Here are some natural ways to help reduce stress and keep your body healthy. You’ve heard this one a lot if you’ve read anything else around here, but it rings true again. Getting the right fuel into your body is vital. Poor diets full of processed foods, sugars and chemicals put a tremendous strain on the body. The wrong carbs can cause insulin levels to rise and the wrong fats can put extra stress on the heart. Antioxidants can help counteract the damage done by free radicals and stress hormones in the body. When stressed, the body actually sheds the potent antioxidant vitamin C, weakening the immune system even more. This is why you need to take an extra dose of this vitamin in times of stress to help prevent yourself from becoming physically ill. For a stress-reducing, body nourishing diet, focus on getting your nutrients from fresh, real whole foods in as close to their natural source as possible. Much easier said than done. In our modern world, toxins are everywhere. In our food, water and air which leads to a toxic build up in the body. If the body is in a state of stress, the liver and kidneys are also not functioning optimally, making toxin removal even more difficult. Try be as organic as possible by avoiding environmental toxins like pesticides and herbicides. Soak non-organic veggies in water and 2 caps of vinegar for an hour to help rid them of their toxins. Drinking enough filtered water to make sure toxins are being flushed out. Very important, drink as much filtered water as possible. Every living organism needs water in order to function properly. 70% of our body mass is water and we need it to digest food, expel waste and flush out toxins. However the tap water, even in first-world countries like the UK, is treated with a large number of chemicals in order to kill bacteria and other microorganisms. In addition, it may contain other undesirable contaminants like toxic metal salts, hormones and pesticides. Those chemicals are carcinogenic and can alter human DNA, cause brain damage, Alzheimer’s and dementia and can put a strain on our bodies. So always try drink filtered water. A mains filter is ideal because it picks up almost all the chemicals and metals, but at the very least use a filter jug. It will pick up most of the heavy metals in the water. Sleep plays a vital role in good health and well-being throughout your life. Getting enough quality sleep can help protect your mental health, physical health and overall quality of life. During sleep, your body goes to work repairing and maintaining your physical health. Lack of or interrupted sleep disrupts the balance of serotonin and melatonin hormone levels, making you groggy during the day and restless at night. Poor sleep can also leads to fatigue, brain fog, memory troubles, and more stress on the body. In children and teens, sleep also helps support growth and development. Fats are present in every cell in your body and help with hormone production and the absorption of antioxidants. There are many kinds of fats, and while your body will use whatever it has, some are certainly more beneficial than others, and some are outright dangerous. Low-fat diets can actually put more stress on the body, as they don’t contain the nutrients needed for you to function at your peak. Essential fatty acids found in beans, nuts and seeds, fruit and vegetables, eggs and oily fish like salmon and tuna will leave you upbeat and smiling. The EPA and DHA associated with omega-3 fatty acids act as antidepressants and you will be eating to reduce your risk of heart disease as well. Where did you get the diagram of the peak performance model? It is well done, if you designed it may I seek permission to use it in a project I am doing? If you did not design it, what is your reference for the bell curve design? Thank you kindly. Hi Mark, sorry for the late reply. Yes, you may use our diagram in your dissertation.